A windmill is an engine powered by the energy of wind to mill grain, often contained in a large building as in traditional post mills, smock mills and tower mills. It also refers to small tower mounted wind engines used to pump water on farms. The modern wind power machines used for generating electricity are more properly called wind turbines. Common applications of windmills are grain milling, water pumping, threshing, and saw mills. Over the ages, windmills have evolved into more sophisticated and efficient wind-powered water pumps and electric power generators. The wind has played a long and important role in the history of human civilization. The first known use of wind dates back 5,000 years to Egypt, where boats used sails to travel from shore to shore. The first true windmill, a machine with vanes attached to an axis to produce circular motion, may have been built as early as 2000 B.C. in ancient Babylon. By the 10th century A.D., windmills with wind-catching surfaces as long as 16 feet and as high as 30 feet were grinding grain in the area now known as eastern Iran [Persia]and Afghanistan. The western world discovered the windmill much later. The earliest written references to working wind machines date from the 12th century. These too were used for milling grain. It was not until a few hundred years later that windmills were modified to pump water and reclaim much of Holland from the sea. The windmill was introduced into England in the 12th century - probably by Crusaders returning from the wars in the Holy Land. These early Mills were quite small and we can glimpse some of their details from mediaeval manuscripts, stained glass and carved representations. Wind power had been used to move ships long before it was applied to grinding corn. To be effective the mill needed the wind to blow toward the sails. As the wind often changes direction it was necessary to be able to face the sails into the wind so that the mill could work. To make this possible the mill body was made to rest upon an upright post. A long lever projecting from the rear of the mill body allowed it to be turned around. Mills of this type are called post mills. The earliest post mills were small and their trestles were not protected from the weather. As the drawing shows the work of putting the heavy timbers in place was not easy. Ropes, pulleys and levers were the chief mechanical aids. The 14th and 15th centuries provide evidence of what the early mills looked like, with illustrations occuring in diverse media such as memorial brasses, stained glass, and wood carvings, as well as the expected manuscript records. 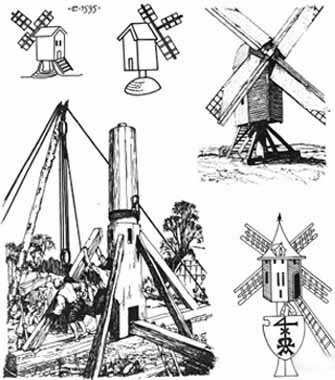 The pinnacles of windmill design include those built by the Dutch (who used windmills extensively to pump water as well grind flour) and the British, who developed many advanced "automatic control" mechanisms over the centuries. As steam power developed, the uncertain power of the wind became less and less economic, and we are left today with a tiny fraction of the elegant structures that once extracted power from the wind. These remaining windmills, scattered throughout the world, are a historic, and certainly very photogenic, reminder of a past technological age. However the promise of power from the wind lives on, both in the form of wind turbines producing electricity, and in the form of small scale windpumps (often largely low-tech "appropriate technology" installations) still used extensively in world agriculture. Millers who used common sails had to stop the mill working if the strength of the wind altered, so that the canvas could be adjusted. In 1772 a Scottish engineer, Andrew Meikle, invented a new type of sail. It was made from a series of shutters which could be opened or closed by a system of levers. This idea made it easier to change a sail's wind resistance but the mill had to be stopped to alter each sail. The design was improved in 1807 when William Cubbit invented his Patent Sails. These could be adjusted without stopping the mill. All the sails could be changed by the movement of the striking rod. To make the sails face the wind the entire post mill had to be turned. This was a cumbersome and time consuming task. Eventually a better way was found to achieve to same end. Masonry towers were constructed and the sails were placed in a cap which could be turned 360 degrees. We do not know who invented the cap but it seems to have been in use by the fourteenth century. Many small drawings appear in manuscripts of that time and examples can be found in stained glass. They may not have known how a mill worked but some drawings do provide technical evidence. Wind power was also used to raise water. The earliest water-raising mills operated scoop wheels. A Scoop-wheel had a lift which was less than its radius. Many mills of this kind were used by the Dutch engineers Nicholas Vermuyden when he drained the Fens in the C17. There were hundreds of drainage mills in various parts of England but most were in Suffolk or Norfolk. Wooden scoop wheels were placed in narrow brick channels and as the wheel turned it pushed water uphill and across the threshold. This then ran off into a higher channel. On a steep slope several wind pumps were used close together. The use of wind energy has been re-valued in recent years. 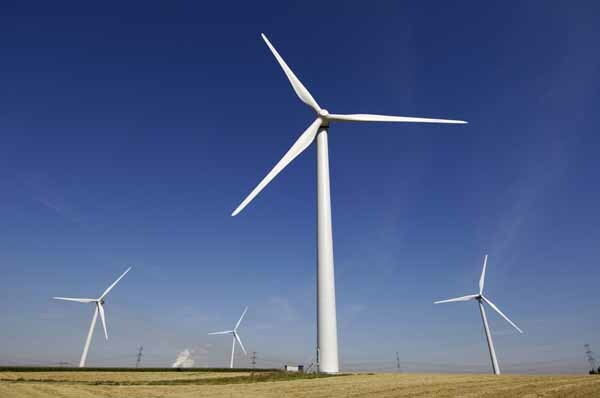 Wind power can be used to generate electricity. Even traditional mills can be constructed to provide power. This Cretan form of mill is one of many to be seen at the Centre for Alternative Technology, Machynlleth. It is simple to build and does not require elaborate tools. The development of the water-pumping windmill in the USA was the major factor in allowing the farming and ranching of vast areas of North America, which were otherwise devoid of readily accessible water. They contributed to the expansion of rail transport systems, throughout the world, by pumping water from wells to supply the needs of the steam locomotives of those early times. They are still used today for the same purpose in some areas of the world where a connection to electric power lines is not a realistic option. The multi-bladed wind turbine atop a lattice tower made of wood or steel was, for many years, a fixture of the landscape throughout rural America. These mills, made by a variety of manufacturers, featured a large number of blades so that they would turn slowly but with considerable torque in low winds and be self regulating in high winds. A tower-top gearbox and crankshaft converted the rotary motion into reciprocating strokes carried downward through a pole or rod to the pump cylinder below.In areas not prone to freezing weather, a pump jack (or standard) was frequently mounted at the top of the well in the center of the base off the tower. This was the connection between the windmill and the pump rod, which generally went through the drop pipe to the cylinder below. The pump jack provided a means for manual operation of the pump when the wind was not blowing. Some pump jacks provided a sealed connection, allowing water to be forced out under pressure allowing a tank at a higher elevation to provide water for a home and other uses, but many had a simple spout allowing water to flow away in a trough by gravity. The drop pipe and pump rod continued down deep into the well, terminating at the pump cylinder below the lowest likely groundwater level. A suction tube usually continued a short distance more. This arrangement allowed wells as deep as 1200 feet (370 m) to be constructed, though most were much more shallow. Windmills and related equipment are still manufactured and installed today on farms and ranches, usually in remote parts of the western United States where electric power is not readily available. The arrival of electricity in rural areas, brought by the Rural Electrification Administration (REA) in the 1930s through 1950s, contributed to the decline in the use of windmills in the US. Today, with increases in energy prices and the expense of replacing electric pumps, has led to an increase in the repair, restoration and installation of new windmills.